The Evidence-Based Teaching (EBT) program supports faculty to try new, research-based teaching strategies in classrooms across disciplines. 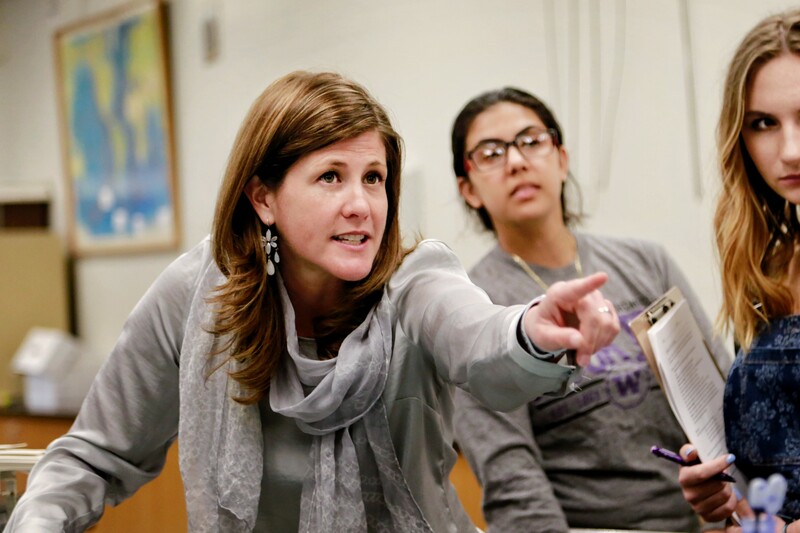 Across the UW, faculty are committed to using the best possible teaching strategies to enhance student learning — whether that learning takes place in large lecture classes or small seminars, in Philosophy or in Oceanography. What are the benefits of being an EBT member? What’s expected of EBT members? At the same time, few faculty have time or support to continuously evolve their teaching — or necessarily know where to begin. Frequently, instructors learn to teach on the job without formal training, and community around teaching and learning can be hard to come by. Enter the Evidence-Based Teaching Program (EBT): a program offering mentorship, a community of peers, opportunities for leadership, and expedited support from the Center for Teaching and Learning and Learning Technologies to faculty in all disciplines. The EBT program also offers opportunities to innovate: to use research on pedagogy, and the support of teaching colleagues, to implement new techniques and tools to become better teachers, and help students become better learners. “From the first meeting, I knew that this is what I’d been looking for: a program that wants to prioritize empirical work in teaching, and support faculty to continuously improve their teaching,” says Lecturer in Philosophy Ian Schnee, who joined EBT in 2016. Over the past two years, participation in EBT has “transformed my teaching,” Schnee says. EBT began in 2015 as part of the Office of the Provost’s Teaching & Learning initiative, in response to a meta-analysis, co-authored by UW researchers including Principal Lecturers in Biology Scott Freeman and Mary Pat Wenderoth, that showed dramatic gains in student learning when instructors use active learning techniques. A small team in Academic & Student Affairs, led by Senior Director Marisa Nickle, partnered with Wenderoth to design the pilot. The program takes a three-phase approach: Exploration, Implementation and Research. 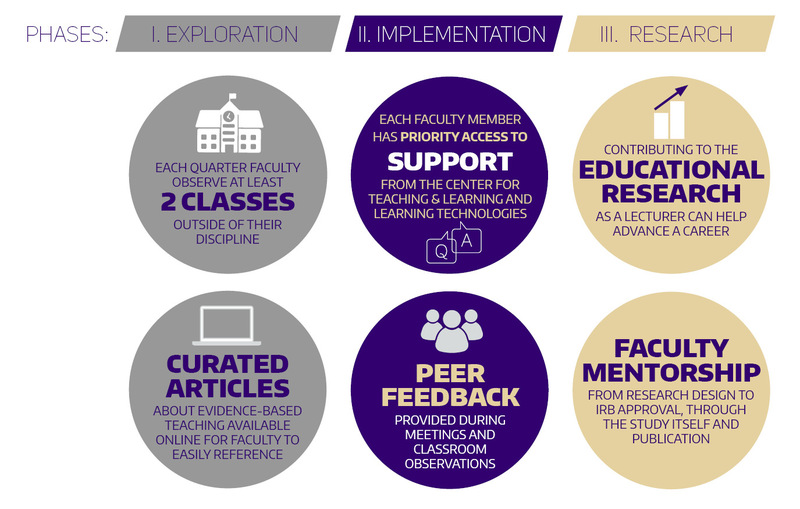 Faculty can participate for just the Exploration quarter, in which they read literature around teaching and learning (as extensively as they’d like) and develop goals for their own courses. Those who stay on for an Implementation quarter then implement those goals with support and mentorship from colleagues who have more experience with EBT. Some faculty are now even conducting their own research. Members can progress through the program’s mentoring ladder, from early-stage participants to group coaches or “leads” — allowing professional development opportunities for tenure-track faculty and lecturers alike. EBT has seen enormous growth over the past three years, largely through word of mouth, as participants share their experiences with colleagues. It continues to attract instructors interested in learning about education research and implementing what they learn in real time, with support from an interdisciplinary community of peers. The program now has three “leads” who have moved up the mentoring ladder: Schnee, Mikelle Nuwer, senior lecturer in Oceanography, and Kimberlee Gillis-Bridges, principal lecturer in English. Faculty from over 50 departments have engaged with the program, from all three campuses; over 13,000 students have taken EBT-informed courses; and the new 2018-2019 cohort is predicted to include over one hundred faculty participants. In the first two phases of the EBT program, members explore existing research on teaching that applies to their own unique contexts. They meet regularly to discuss what they’ve read, as well as their own goals and potential challenges, and they observe at least two other participants’ courses. Those who stay on then implement their findings in their own classrooms, while continuing to meet in small groups to share and troubleshoot. Mikelle Nuwer tends to teach large lecture courses in Oceanography — and like many faculty, she used to rely in large part on a traditional lecture format. But reading and discussing the evidence on active learning, and receiving support from EBT peers as she implemented new strategies, has fundamentally changed her teaching, she says. “EBT has been really important in showing me again both why I love to teach and how I can do it better,” says Mikelle Nuwer, senior lecturer in Oceanography. Photo credit: Shantelle Liu. Now, she relies on active learning techniques that have been shown to be more effective at engaging students. These include assigning more collaborative group work and think-pair-share activities, and using clickers to increase engagement. Nuwer has seen the results for herself, she says. Even in large lectures, more students participate more actively, more often. “Because of the diversity of our students, having a toolbox — tools to engage different learning styles — is really important,” she says. And faculty are using evidence to do more than just restructure class time. Research is continuously being published on everything from online and hybrid teaching, to assessment strategies, to creating inclusive classrooms. The program also offers unique opportunities for leadership. Participants receive mentorship and collaborate with peers throughout each phase of EBT, but they can also move up the mentoring ladder to become coaches, and continue to learn through leading others. 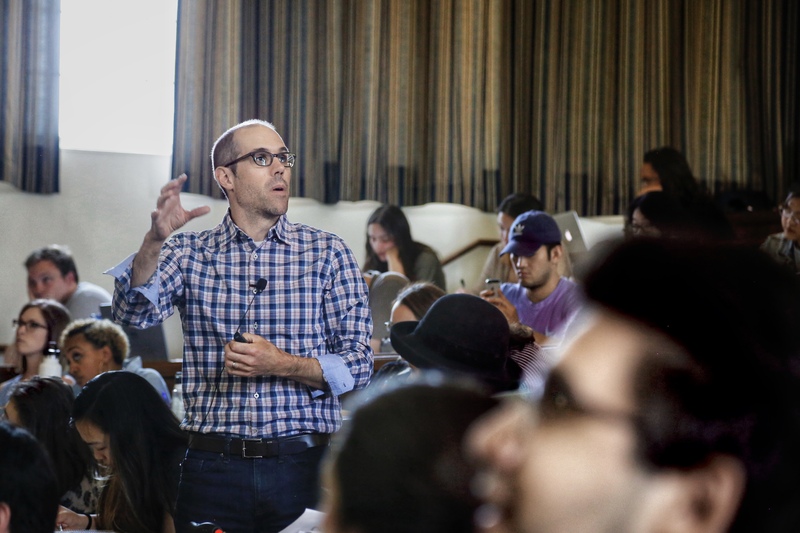 Ian Schnee, lecturer in Philosophy, makes use of polling tools such as Poll Everywhere in his large lecture classes – an evidence-based technique to increase student engagement. Photo credit: Shantelle Liu. The interdisciplinary peer group can have an enormous, even surprising impact. Approaches more common to teaching in the humanities can help STEM instructors think differently about their own habits, and vice versa. Meanwhile, says Schnee, “it becomes apparent that we do so many things in common. Everyone teaches critical reasoning; everyone strives to do more than teach facts, but to teach students how to apply facts and problem-solve,” he says. Nuwer, for one, developed new assessment techniques for her Oceanography courses after observing how EBT colleague Gillis-Bridges evaluates student work in her English courses. “Kimberlee’s assessment tools were so different,” Nuwer says. “To see what she expects from her students inspired me.” Now, Nuwer uses a combination of assessments in addition to exams, including having students create videos or posters — techniques borrowed from Gillis-Bridges and other colleagues in other fields. The program has the potential to grow in a number of ways: by bringing in more faculty from more departments; by encouraging new faculty to participate in their first few years teaching; and by supporting original research from EBT participants on the scholarship of teaching and learning — research they can publish and add to the growing body of evidence. And EBT’s impact can extend to the departmental level, as departments such as Public Health and Philosophy have discovered. The Philosophy department has launched a new committee, led by Schnee, to review findings from EBT groups and potentially implement EBT-based techniques across Philosophy curricula. “The EBT program is helping the Philosophy Department to bring best practices to the entire department, helping us to think outside the box to make our courses more engaging and effective,” says Andrea Woody, chair of Philosophy.